President Miguel Diaz-Canel said an investigation was under way into Friday's crash of the nearly 40-year-old Boeing 737, leased to the national carrier Cubana de Aviacion by a Mexican company. Three women pulled alive from the mangled wreckage are the only known survivors. The Boeing crashed shortly after taking off from Jose Marti airport, coming down in a field near the airport and sending a thick column of acrid smoke into the air. The mourning period is to last from 6:00 am (1000 GMT) Saturday to midnight on Sunday, the Communist Party leader and former president Raul Castro said. Flags are to be flown at half-mast throughout the country. The plane was on an internal flight from Havana to the eastern city of Holguin. Most of the passengers were Cuban, with five foreigners, including two Argentines, among them. The plane -- carrying 104 passengers -- was almost completely destroyed in the crash and subsequent fire. Firefighters raced to the scene put out the blaze along with a fleet of ambulances to assist any survivors. Built in 1979, the plane was leased from a small Mexican company, Global Air, also known as Aerolineas Damoj. Mexico said it was sending two civil aviation specialists to help in the investigation. The six crew members were Mexican nationals. A press conference is scheduled for 1900 GMT. The 58-year-old Diaz-Canel, who succeeded Castro as the communist island's leader only last month, appeared aghast as he surveyed the recovery efforts, wearing a short-sleeved green shirt and surrounded by officials. Castro sent condolences to families of the victims of the "catastrophic accident," a statement read, as Russian President Vladimir Putin and a string of Latin American leaders also expressed sympathy. The plane took off from Havana at 12:08 pm (1608 GMT) Friday heading for Holguin, 670 kilometers (415 miles) to the east. "I saw it taking off. All of a sudden, it made a turn, and went down. We were all amazed," he said. "The explosion shook everything," he said. "I started running, I was so afraid." Global Air said the plane was flying with a crew of six Mexicans -- the pilot, co-pilot, three flight attendants and a maintenance technician. In Mexico City, anguished relatives and colleagues of the crew gathered outside the company's offices demanding information -- some of them hugging and crying. "I was friends with the captain, with the co-pilot, with the head flight attendant," said a former Global Air employee, 44-year-old Ana Marlene Covarrubias. "When I heard the news on the phone, I thought it was one of those jokes people play," she told AFP. 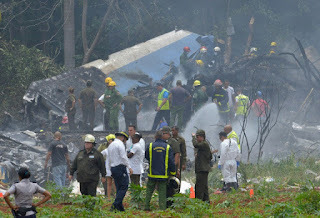 Prior to Friday's crash, Cuba's most recent air accident occurred in April 2017, when eight military personnel died when a Russian-made AN-26 transport aircraft went down in western Cuba. The country's last major airline disaster was in November 2010 when a Cuban Aerocaribbean jet crashed on a flight from Santiago de Cuba to Havana, killing all 68 people on board, including 28 foreigners. 0 Response to "Cuba mourns after 107 killed in airliner crash"